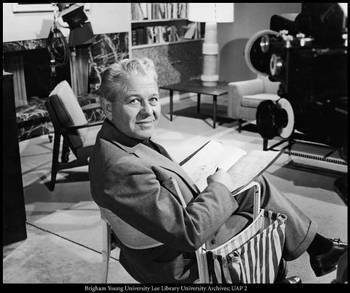 “Judge” Wetzel Orson Whitaker (September 30, 1908–November 1, 1985) was a prominent American animator and filmmaker, recognized for his work with Walt Disney Studios and The Church of Jesus Christ of Latter-day Saints. Whitaker was a member of the LDS Church. Whitaker was born in Heber City, Utah. His family moved to Brigham City, Utah, just before his fifth birthday and then to Denver, Colorado, close to his tenth birthday. At his high school in Denver, he was one of the staff artists for the yearbook. After his graduation, he moved with his family to Huntington Park, California, where he used his artistic talents in the display department of Western Auto Supply. A few months later he went to work in the promotion department of Montgomery Ward retail stores in Chicago doing silkscreen work. He attended the American Academy of Art for one year. He went back to California and bought a cleaning and pressing business, hoping to acquire enough money to marry. That venture was not successful, so he returned to Montgomery Ward and enrolled in the Art Institute of Chicago. He was art director for the St. Louis Times until the rival St. Louis Star absorbed the paper. Whitaker took a year off in 1952 to join with his brothers, Berlin, Ferrin, and Scott to develop The Homestead Resort at the site of some natural hot springs near his birthplace in the Heber Valley. When Walt Disney heard of his plan, he said, “All of my life I have wanted to do something like that, and here I am stuck with this [the studio]. Take your year, and then come back and your job will be waiting.” At the end of that year, Disney formed WED Enterprises (now known as Walt Disney Imagineering), the design and development branch of the Disney corporation to create and construct Disney theme parks, resorts, and other entertainment venues. While Whitaker was working on the Homestead project, then LDS Church president David O. McKay asked him to head a newly created Motion Picture studio at Brigham Young University. Whitaker had devoted two years of his spare time in the 1940s to complete two films about the LDS welfare program (Welfare in Action and The Lord’s Way). Consequently, Whitaker resigned from Disney and built the BYU department from scratch. UCLA and BYU were the only two university film production facilities at that time. From about 1951 to 1974, Whitaker collaborated with his brother Scott Whitaker in making LDS films, such as Man’s Search for Happiness, The Windows of Heaven, Johnny Lingo, and Pioneers in Petticoats. More than 150 films were produced during his tenure as director and producer at the studio. BYU awarded him an honorary doctorate of fine arts in 1971. He retired from the BYU studio in 1974. Whitaker became known as Judge after an older brother called him “Judge” to tease him by comparing him to the local justice of the peace who apparently was not physically attractive. The name caught on with his neighbors and peers and he grew to like it. Close associates and family new him as Judge. His work with Disney was credited as Judge Whitaker. His work with BYU productions, however, was credited as Wetzel O. Whitaker. Whitaker is the subject of a Tom Laughlin documentary called “A Reel Legacy.” It premiered at the 2012 BYU Mormon Media Symposium and at the 2012 LDS Film Festival. It won “Best of State 2013” in documentary and three Aurora Awards. Whitaker and his wife Doris Youkstetter had four children. She died in 1971. He married Louise Eccles in 1973.